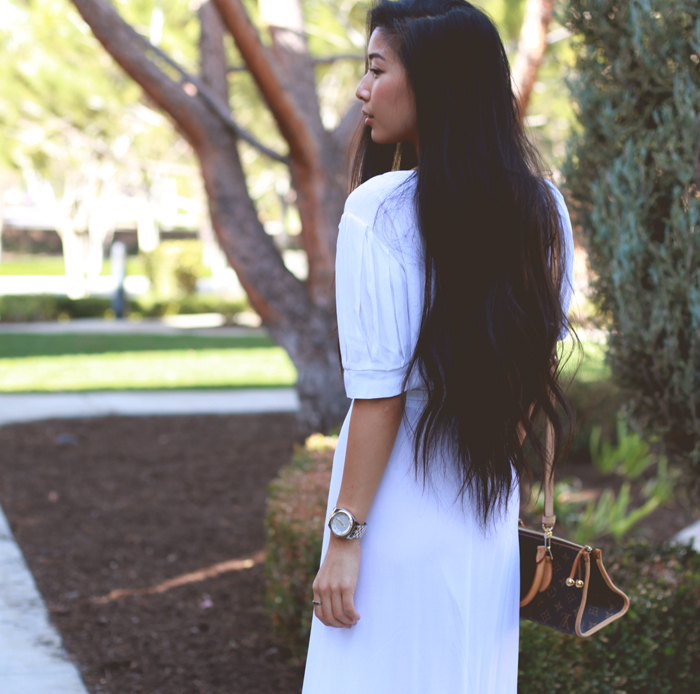 Reformation dress. Louis Vuitton bag. Jeffrey Campbell shoes. Nixon watch. Gorjana bracelet. Stella & Bow ring. This dress is just like, woah. I'm a sucker for white, heavenly garments that move like a dream and that can transport me back to a real Gatsby world. It was a perfectly warm, 80º winter day to wear this out for the first time and it was a gorgeous fit for a romantic, surprise gondola ride in the Venice Canals for Kyle and I's anniversary. Needless to say, Reformation helped me ring in the new year beautifully. wow you have such beautiful hair!! <3 amazing! The dressing is so beautiful & pure looking. I'd be a little scared to wear it during holiday festivities but it looks perfect on you. Thank you :) White is one of my favorite colors to wear during winter! Love this look! That dress is absolutely gorgeous on you! That dress is stunning! I love your style and your blog! Thank you Karina, so sweet of you to stop by! I can see why you were smitten with that dress - it is gorgeous! Don't get me started on how obsessed I am with it! Thank you Rebecca. business using a straightforward in addition to stable supervision process.